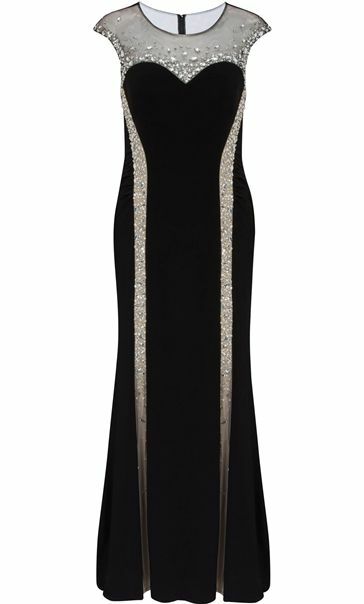 Floor sweeping, elegant, black evening maxi dress that is a statement choice for that must attend event. 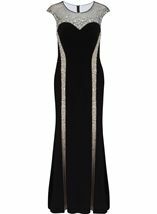 Sleeveless cut in a fit and flare design with mesh detailing to the shoulders, round neckline and champagne mesh panels running down the front, finished with luxurious polished beading that decorates the dress beautifully. 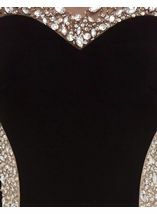 This dress boasts a structured bodice that gives a high class finish, ruching to the sides and back and is lined with concealed back zip fastening for a flattering fit, team with heels and simple accessories for a head turning look. Back length 142cms.